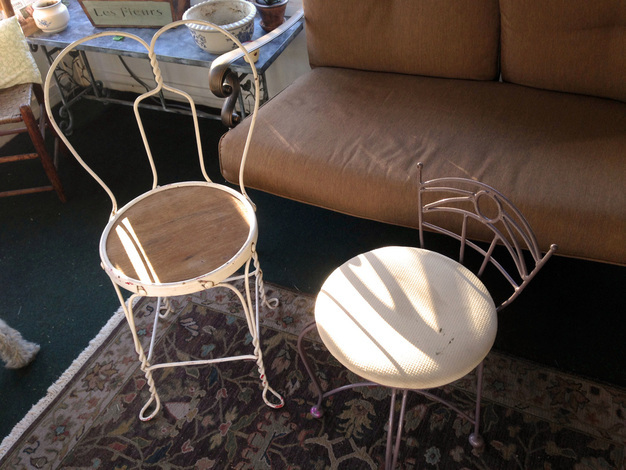 Every time I go to a flea market, a thrift store, even Home Goods, I come home with chairs. I just love chairs. They can dress a space up, accentuate certain colors, bring back a classic look – they just bring so much personality to a room. And, I love how easily you can redo them. 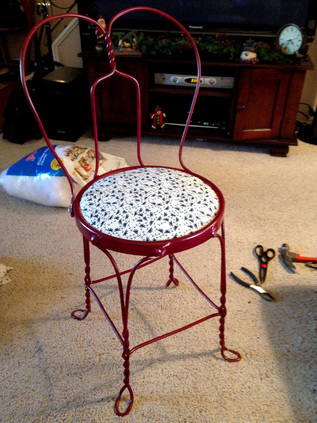 With a little spray paint and new fabric, you can easily bring a chair new life. When we were planning to move out of our old house, we had accumulated so many things that Ash told me I wasn’t allowed to bring home any more chairs (or books but that’s a different story). He was right, as we had enough seats in our house for a Sunday mass. 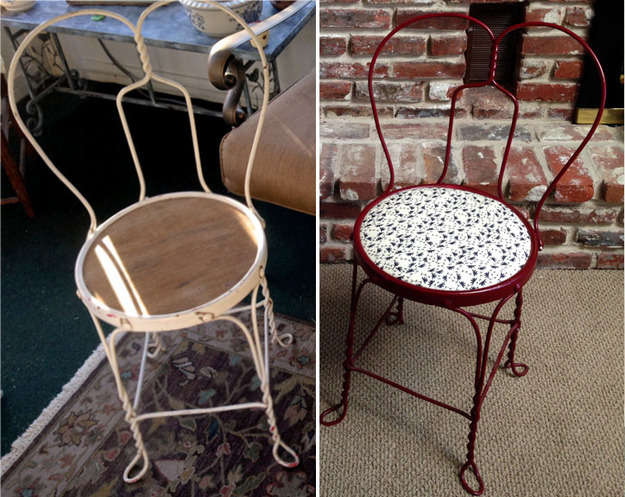 Before chairs were off limits, I cleaned up a few flea market finds that are now household favorites. 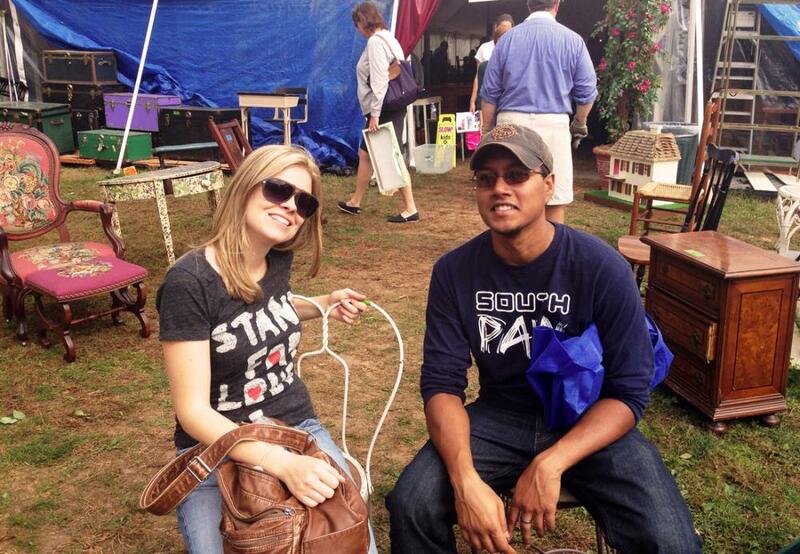 Here’s Ash and I at one of our favorite rummage sales, sitting on the two chairs I later fixed up. ​Each of these chairs cost less than $10, which was a steal! Below is a better picture of the two chairs. The one on the left is an ice cream chair with a wooden seat. Although white, the chipping paint revealed that it had previously been red. My thinking was to bring back the red with a cranberry color. My grandma had ice cream chairs in that color, and I love little reminders of her. The one on the right was a purple-ish tan with an old, dingy cushion. My plan was to make this more modern looking, as I wanted to use this chair for my make-up vanity. I was thinking a dark bronze color. 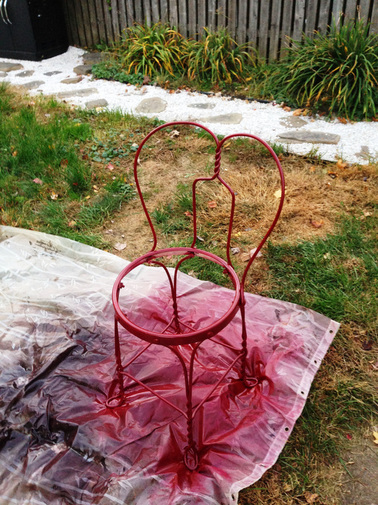 I decided on spray painting the chairs. It would be easy and spray paint comes in so many colors. First, I took the seats out of the chairs pretty easily by unscrewing some bolts. Then, I put the chairs back together without the seats, in order to spray the whole chair. 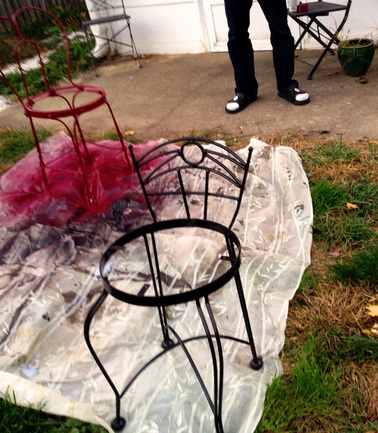 ​When painting, I threw down an old shower curtain. 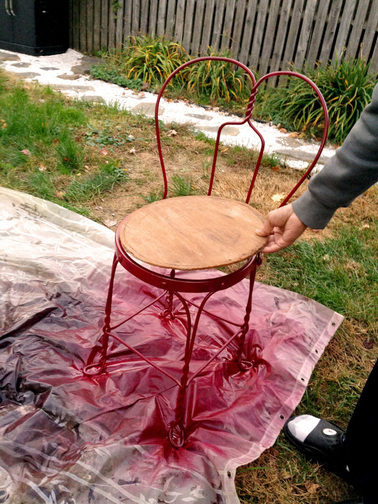 After preparing, I applied one thick coat of spray paint on each chair. 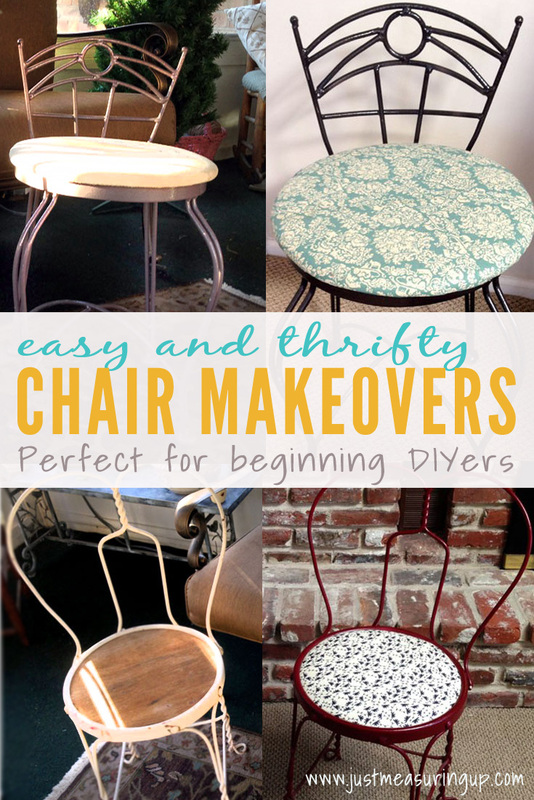 The vanity chair looks darker than actuality in these pictures. It’s more of a deep bronze than a black color. For the ice cream chair, I chose two fabrics that I loved from Joann Fabric. They were very different patterns because I wasn’t sure which would look better. (I’m very visual and need to see how things would look. It probably would be weird if I carried the chairs through the store holding fabrics up to it – so I just bought my two favorites. So, I decided at home that the navy blue paisley pattern on an off-white background was the winner. 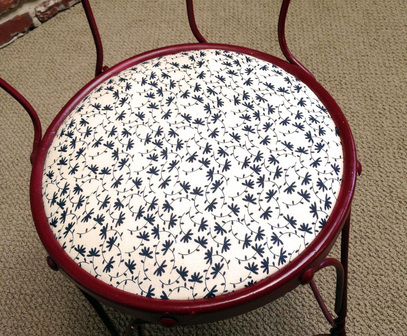 ​I loved how the cranberry color contrasted with the navy in the pattern on the finished product. To attach the new fabric, I put the current seat on top of the fabric and cut a large square around it. When cutting, I gave myself about three extra inches around the seat. Then, I wrapped the seat loosely with the fabric and added stuffing – the white fluffy cushion material (pictured on the floor below). ​Next, I pulled the fabric over the underside of the disk and used my staple gun to give it a tight wrap. After screwing the bolts back in, I had a brand new looking seat! As for the vanity chair, I chose a turquoise and ivory pattern that worked well with the dark bronze spray paint. This chair already had a cushion, so that saved some time. ​In putting this chair back together, I simply wrapped the fabric tightly around the existing seat, used the staple gun to secure the fabric, and then screwed the seat back in. The chair was looking good – and it worked perfectly with my make-up vanity. 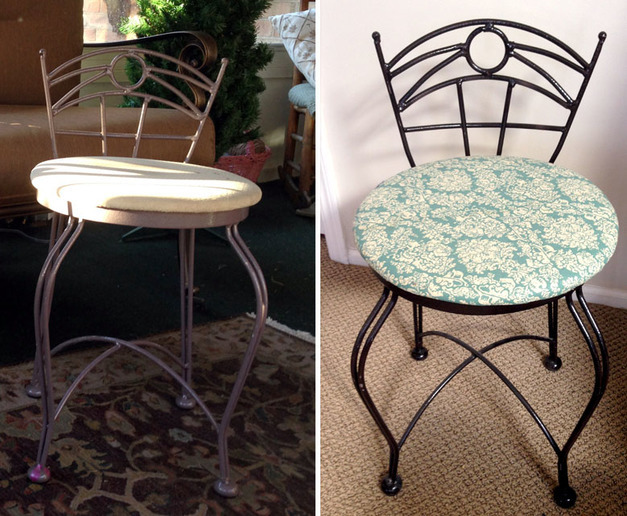 Here’s a before and after of the vanity chair. The total cost of making over both chairs was less than $30, including the chairs, stuffing, and fabric. The time spent working was less than two hours. The longest part was the dry time. ​I love how both of the chairs turned out – especially the ice cream chair.